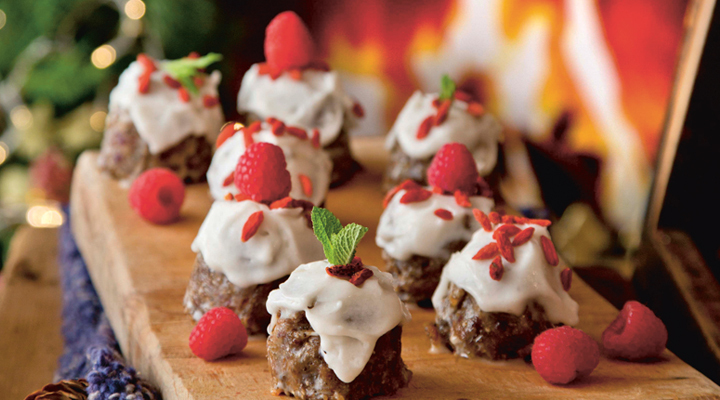 Take the hard work out of your Christmas pudding and give these a try. They only take 35 minutes make. These bite-sized treats are as pretty as they are delicious! 1. Place all the pudding ingredients except the orange juice and coconut oil in a food processor and blend until it reaches a crumb-like consistency. Transfer to a large mixing bowl, then add the orange juice and melted coconut oil. Mix well until everything is uniform in texture. This will take a minute. 2. Using an egg cup as a mould, line the cup with some parchment paper, then pack the pudding mixture into the egg cup. Pull out the parchment and a lovely little pudding pops out! Repeat until all the mixture is used. You should get about 12 little pieces. Put your little puddings in the fridge to harden while you make the icing. 3. To make the icing, place the coconut oil or cacao butter in a bowl set over a saucepan of boiling water and allow to melt. Remove from the heat, then fold in the coconut cream and honey until well combined. It will thicken as it cools, so make sure to stir occasionally so that it’s lovely and smooth. 4. Once the icing is suitably thick yet still spreadable, spoon the icing over the puddings. Decorate the puddings with some fresh raspberries and goji berries and put back in the fridge for 10 to 15 minutes, until the icing is firm. Add some mint leaves before serving.